Growth in ATM numbers is down to less than a third from two years ago. 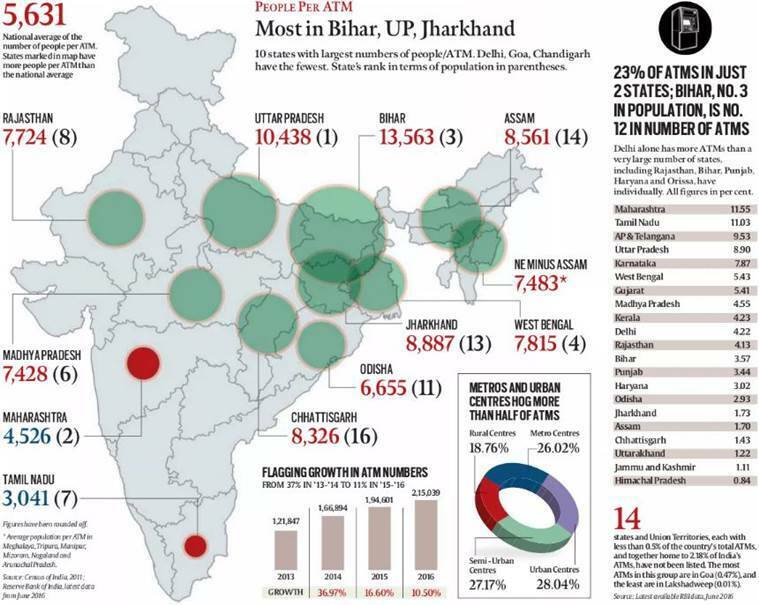 Bihar, with 6 times Delhi’s population, has fewer ATMs than the national capital and 7 times more people per machine. Maharashtra and TN are home to over a fifth of all India’s ATMs. RBI and Census numbers demonstrate a stark skew. For two years now, the growth rate of ATMs in the country has been falling steadily. The year-on-year growth between June 2015 and June 2016 (till when Reserve Bank of India data is available) was just 10.5%, significantly slower than the corresponding growth of 16.6% between 2014 and 2015. Between June 2013 and June 2014, ATM growth had galloped at 36.97%. There is also a pronounced skew in the distribution of India’s ATMs — just two states, Maharashtra and Tamil Nadu, account for 22.5% of the total number of cash machines, according RBI data on ATMs and banking. In June 2016, India had 2,15,039 ATMs, 48,557 of which were in these two states. The RBI data also show a skew in favour of metropolitan and urban areas. For example, Delhi (9,070) had more money machines than 25 states, including Rajasthan, Bihar, Punjab, Haryana, Odisha and Jharkhand. Delhi is the 18th most populated state in India according to the 2011 Census, with 1.39% of the population — however, the RBI data show it has 4.22% of India’s ATMs. Juxtaposed with Census data, RBI’s ATM data show a stark divide between the urban and rural populations with regard to access to ATMs. 69% of the country is classified as rural, but they have access to 45.93% of ATMs; 31% of the population is urban, but it has access to 54.07% of ATMs. The slowdown in the growth of ATMs has hit rural India the hardest. Between 2013 and 2014, ATMs in rural India grew by 100%; the following year, that growth fell to 37% and, last year, rural India recorded an increase of a little under 14%. RBI data also show that some of India’s most populated states — Uttar Pradesh, Bihar and West Bengal — had to accommodate far more people per ATM than the country average of 5,631 people/ATM. In UP, Bihar and West Bengal, that figure in 2016 was 10,438, 13,563 and 7,815. 1 Three parents, 1 baby — how does that work, in theory and practice?